This third release in the series of Liszt’s complete piano music contains a mixture of the known and the unknown, and comprises some of Liszt’s forays into larger forms (others are the Sonata, the Scherzo and March and the transcriptions). The first obvious feature is that Liszt never repeated a formal structure—and this applies equally well to the shorter piano works, and certainly to the orchestral, choral and chamber music. His search for new forms was constant and, while the Sonata and the ‘Faust’ Symphony may be his finest resolutions of the quest, his solutions are always of interest for their very variety of invention. The old Kapellmeister from Eisenach was the first to use his name as the basis of a musical theme, and a great many of his later admirers have found his example irresistible. The theme itself (B flat–A–C–B natural) has an appealing symmetry which made it useful alike to Schumann, Liszt, Brahms, Reger and Webern, to name but a few. Liszt’s great Fantasy and Fugue is as much a pioneering product of the then avant-garde as it is a homage to Bach, and the intense chromaticism frequently makes us lose all sight of tonality, although the work basically revolves around G minor and B flat major. As is well known, the piece was originally composed for the organ, probably based on one of Liszt’s own improvisations. But there is nothing haphazard about the final form of the work, and the Fugue contains a good many contrapuntal and harmonic subtleties. The might of the piece’s dramatic argument has always kept it among Liszt’s most popular works, even if more in the organ world than that of the piano. The original version for organ (entitled Präludium und Fuge) dates from 1856 and was arranged for piano in 1870. In 1871 Liszt issued revised versions for both instruments under the present title. For some reason the New Liszt Edition is issuing the two ‘Weinen, Klagen’ pieces amongst the volumes of transcriptions and fantasies on other composers’ materials, but that has no more sense than to regard, say, Brahms’s ‘Handel’ Variations in a similar way, for these are certainly original compositions in every sense of the word. Both works bear a dedication to Anton Rubinstein, and both are based on the same wonderful theme. The Prelude of 1859 is a dignified and restrained piece with just one dramatic outburst, all within the framework of a passacaglia which unfolds 25 variations on the motif. The Variations are not simply an expansion of the earlier piece, although there are a few fragments in common. The work dates from 1862 and was motivated by the death of Liszt’s elder daughter, Blandine. A fierce introduction leads to the theme and 43 variations, followed by a chromatic development in the shape of a recitative, and then a group of freer, faster variations, culminating with the choral ‘Was Gott tut, das ist wohlgetan’ (which also ends Bach’s cantata) and a brief coda in which the two themes are juxtaposed before F minor finally gives way to an unequivocally optimistic F major. Liszt’s Funeral Odes were composed between 1860 and 1866, and exist in a variety of versions: the first is also an organ piece, with the title Trauerode, as well as an orchestral piece, like the other two Odes. There is also a chorus in the first Ode and the possibility of a narrator in the first and second. La Notte also exists for violin and piano, and the version for piano solo was published for the first time as recently as 1980 by the excellent Neue Liszt-Ausgabe. The third of the Odes is also entitled ‘Epilogue to the Symphonic Poem: Tasso, Lamento e Trionfo’ and in its orchestral version enjoyed a certain vogue towards the end of the nineteenth century. Although it is quite clear from the original manuscript of the piano version of the third Ode that Liszt intended these works to be performed as a cycle, they have never been published together and have rarely been performed as he wished. 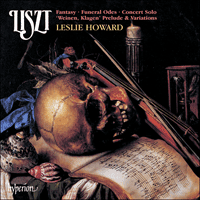 Les Morts was prompted by the death of Liszt’s only son Daniel at the age of twenty, and is constructed about an Oraison by Lamennais: the end of each stanza of both poem and music has the refrain ‘Blessed are those who die in the Lord’, and towards the end quotes the psalm ‘De Profundis’ and the ‘Sanctus’. By following the structure of the poem, Liszt evolves a highly original musical form. Le triomphe funèbre du Tasse is prefaced by a quotation from Pierantonio Serassi’s account of Tasso’s funeral, at which all of those who had sought to vilify and persecute the poet during his lifetime turned up in all their finery to lament his passing. Liszt certainly believed that his time too would not come until after his own death, and this piece can be seen as a self-portrait as much as it can a work honouring Tasso who, as we have seen, was the subject of an earlier symphonic poem written as an overture to Goethe’s play. Although the Ode uses two themes from the symphonic poem it stands as a completely independent work, and like the other Odes is characterized by dignity and restraint, as well as extremely forward-looking chromaticism. These are no mere transcriptions! Liszt’s genius for beautiful titles deserted him only once—the Grosses Konzertsolo is a mere stab at a title for a long work which is not yet a sonata, but no longer a character piece. Forerunner of the B minor Sonata it certainly is, however, and the history of the composition shows that Liszt was much preoccupied with it. The piece was written between 1849 and 1850, and dedicated to Adolf Henselt who professed himself unable to play it, even though Liszt had intended it as a competition piece for the Paris Conservatoire. The original is a simple one-movement Allegro, and the piece also exists in an unpublished version for piano and orchestra (not to be confused with the recently discovered ‘third’ concerto). Some time before the publication in 1851, Liszt expanded the work by adding a slow central section whose material he also worked into the later stages of the piece. Later still Liszt arranged the piece for two pianos under the title Concerto Pathétique and at the end of his life supervised his student Eduard Reuss in the production of a new version for piano and orchestra, to which Liszt added several new passages. In any case, this is an extremely interesting work in its own right, and is unaccountably neglected, especially by students who might well benefit from consulting this piece before tackling the Sonata!